Two horse figurines were recently discovered in Israel. 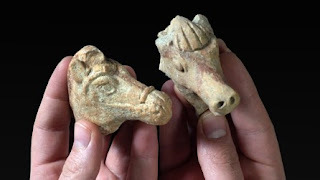 One of the horses appears to be from the Iron Age (1200-586 BC) and the other from the Hellenistic period (332-37 BC). There is a good article with pictures here. If you are interested in horses and the Bible, a good academic resource is Deborah Cantrell's The Horsemen of Israel: Horses and Chariotry in Monarchic Israel which is currently on sale for 50%-off here.